Three days after Catherine of Aragon had appeared at the Legatine Court at Blackfriars to lodge her appeals against the court proceedings into the validity of her marriage to Henry VIII, she again appeared in front of Cardinals Wolsey and Campeggio, and this time her husband was present. “Sir, I beseech you for all the loves that hath been between us, and for the love of God, let me have justice and right, take of me some pity and compassion, for I am a poor woman, and a stranger born out of your dominion. I have here no assured friend, and much less indifferent counsel. I flee to you as to the head of justice within this realm. Alas! Sir, wherein have I offended you, or what occasion of displeasure? Have I designed against your will and pleasure; intending (as I perceive) to put me from you? I take God ansd all the world to witness, that I have been to you a true, humble and obedient wife, ever comfortable to your will and pleasure, that never said or did any thing to the contrary thereof, being always well pleased and contented with all things wherein you had any delight or dalliance, whether it were in little or much. I never grudged in word or countenance, or showed a visage or spark of discontentation. I loved all those whom ye loved, only for your sake, whether I had cause or no, and whether they were my friends or my enemies. This twenty years I have been your true wife or more, and by me ye have had divers children, although it hath pleased God to call them out of this world, which hath been no default in me. that they elected and gathered as wise counsellors about them as to their high discretions was thought meet. Also, as me seemeth, there was in those days as wise, as well learned men, and men of as good judgment as be at this present in both realms, who thought then the marriage between you and me good and lawful. Therefore it is a wonder to hear what new inventions are now invented against me, that never intended but honesty. And cause me to stand to the order and judgment of this new court, wherein ye may do me much wrong, if ye intend any cruelty; for ye may condemn me for lack of sufficient answer, having no indifferent counsel, but such as be assigned me, with whose wisdom and learning I am not acquainted. Ye must consider that they cannot be indifferent counsellors for my part which be your subjects, and taken out of your own council before, wherein they be made privy, and dare not, for your displeasure, disobey your will and intent, being once made privy thereto. Cardinal Wolsey then asked the King to confirm that Wolsey was not “the chief inventor or first mover of this matter” and the King replied, “Nay, my lord Cardinal, I can well excuse you herein. 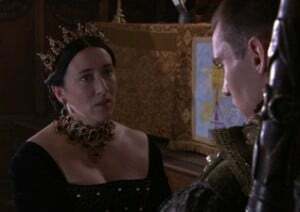 Ye have been rather against me.” According to Cavendish, the King then explained that his conscience had been “pricked” by words spoken by the Bishop of Bayonne, the French ambassador, when a marriage was being brokered between Princess Mary and the Duke of Orleans. The bishop, apparently, had wanted to make sure that Mary was legitimate “in respect of the marriage which was sometime between the queen here, and my brother the late Prince Arthur.” If we are to believe Henry VIII, these words then made him begin to doubt the validity of his marriage and consider whether it was better for the country for him to take another wife. The court was then adjourned for the day. David Starkey comments that Catherine “had knelt. But she had fought and won.”6 Whatever the King said, he could not match the words of his Queen. She’d won the battle, but Henry would win the war. 1494 – Birth of George Cavendish, Cardinal Wolsey’s gentleman usher and the writer of “The Life of Cardinal Wolsey”. 1553 – Letters patent issued changing Edward VI’s heir from his half-sister, Mary, to Lady Jane Grey. « Did Anne Boleyn Have a Stepmother? You know, the first time I read Catherine’s words was in Maxwell Anderson’s “Anne of the Thousand Days” – the play. I was so disappointed that they cut that speech from the movie. Despite bad physical casting, Irene Pappas had the passion to do that speech and own it, but they either didn’t give her the chance or it ended up on the cutting room floor. From the abrupt way Catherine enters the court and appeals to Rome, I have a feeling they filmed her speech but then cut it from the film. A real shame.